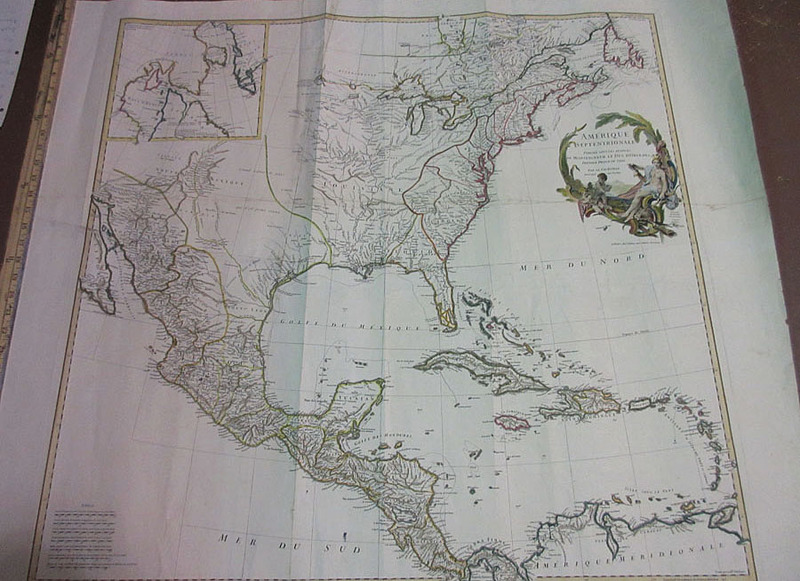 North American Prints and Maps. 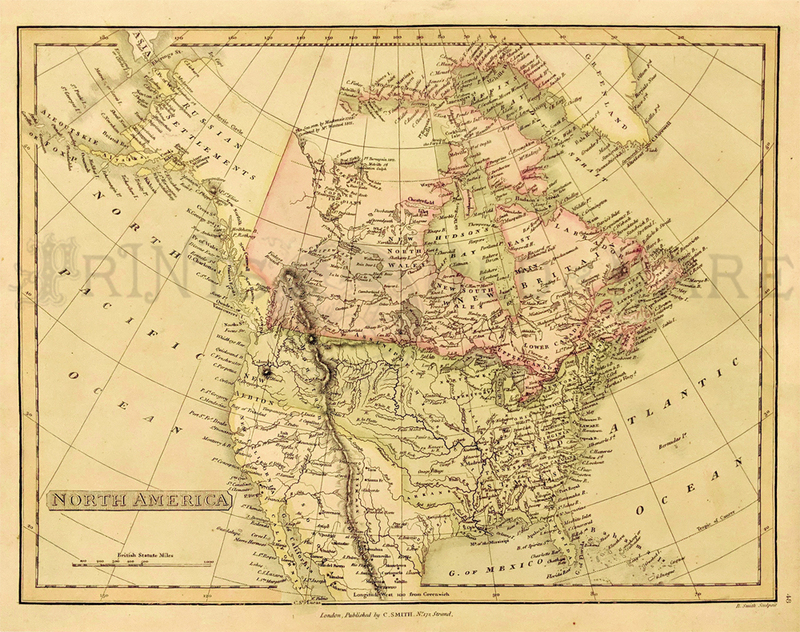 A New Map of Part of North America, Carey 1808 - A very handsome hand colored and highly detailed engraved map of the Northern portion of the United States, from John Cary's New Universal Atlas. 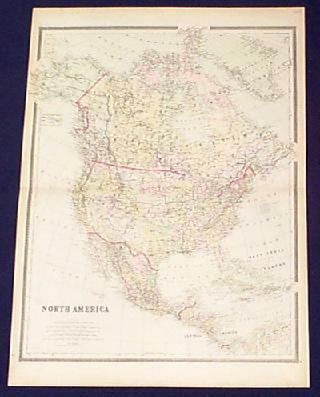 The map includes the District of Maine and Ohio, which is still called The Western Territory. The map contains many interesting features: at the mouth of the Cayanhoga River on Lake Erie, there is a note about a seventy foot rock which makes navigation dangerous. Another note indicates that the easiest passage from Lake Erie to the Mississippi & Ohio Rivers is via the Sandusky & Sioto Rivers. A proposed fort is noted south of Detroit. The western boundary of the six Indian Nations in Western NY is noted. There are similar notes throughout the map, including annotations on each of the Great Lakes. The map is highly detailed and includes towns, roads, rivers, Indian details, springs, and a host of other information. 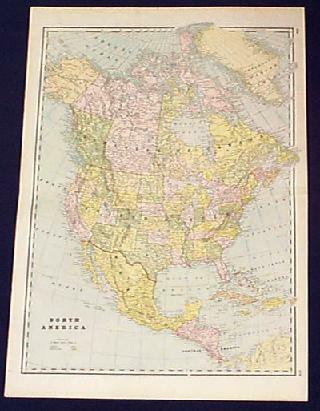 Condition: Good, the map is mounted on fine thick paper, browning stain on vertical middle fold. 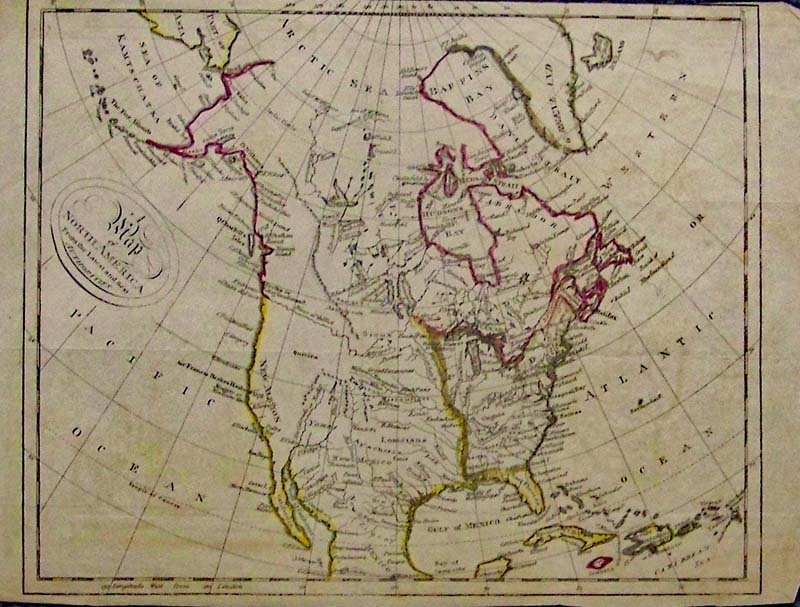 North America from the Best Authorities, Baker 1800 - An unusual engraved and hand colored map of the North American continent engraved by B. Baker Islington, with the eastern coast well populated and the western regions largely unmapped, however, the Louisiana Territory is shown. 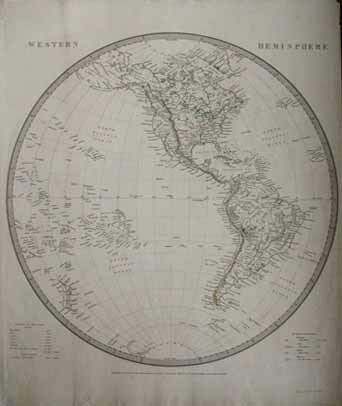 The well charted Pacific coast shows the map to be post the “Third Voyage of Captain James Cook,” but the continental interior does not yet reflect the discoveries of the Lewis and Clark expedition 1804-1806. An apocryphal "River of the West" with headwaters in the "Oregon River" flows from the center of the continent, although there is no central mountain chain marked. 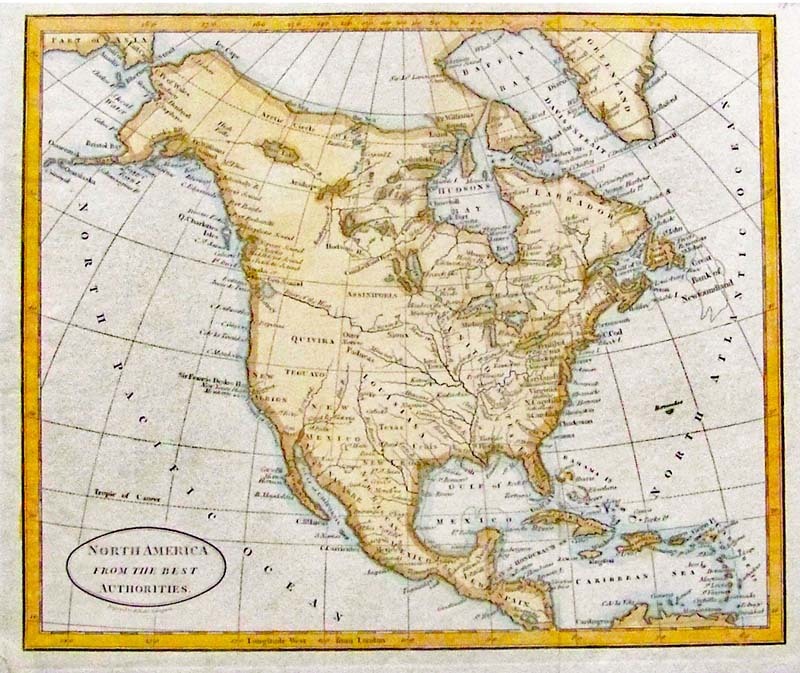 A fascinating map from the early years of the United States. Condition: Good, small margins, left bottom corner torn. 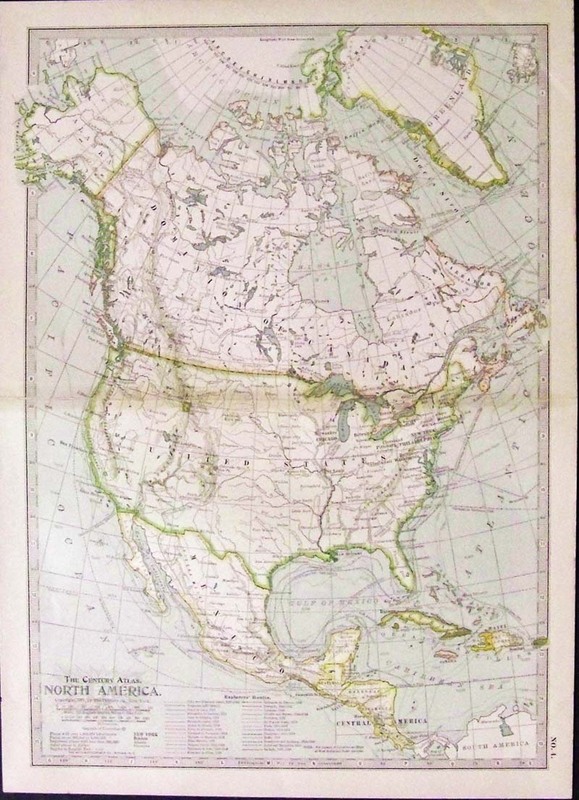 North America, Sidney Hall 1886 - An attractive engraved and original pastel colored map by Sidney Hall, published in Black's General Atlas, Canada is British Territory, Oregon extends into British Columbia, no Arizona, Washington State, or Idaho, Dakota’s and Minnesota one etc. Condition: Very good, wide margins, browning on edges small tooth six piece missing from bottom left margin. 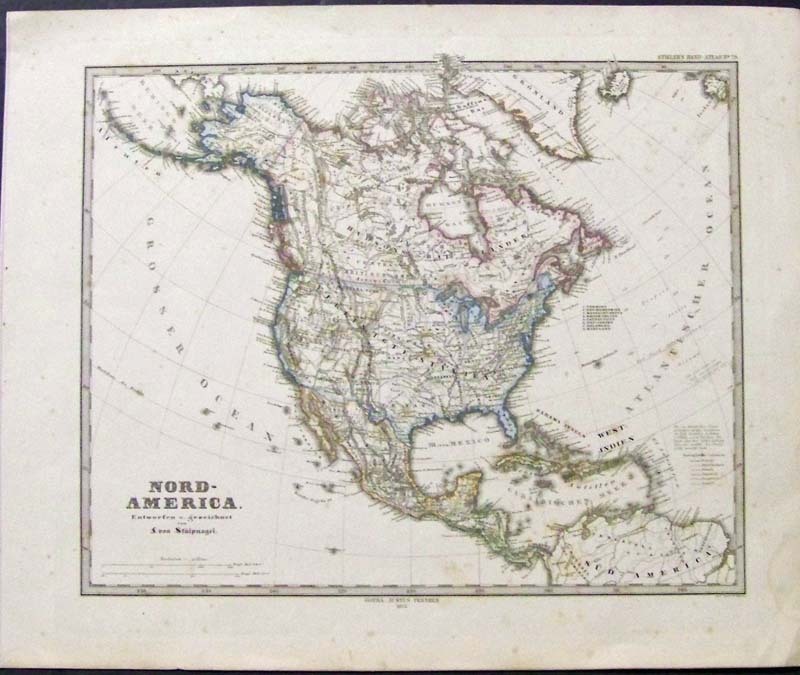 A Map of North America from the Latest and Best Authorities, Morse 1796 - A rare engraved small black and white map of North America, by Jedidiah Morse, from "The American Universal Geography", 1796. Includes New Albion and Sir Francis Drake's Harbor in California. New Albion, also known as Nova Albion, was the name of all North America north of Mexico, from "sea to sea," claimed by Sir Francis Drake for England in 1579. The extent of New Albion and the location of Drake's port have long been debated by historians, with most believing that he came ashore in the Bay Area on the coast of northern California. Also includes the River of the West, an imaginary river that connects the east and west coasts (promoted by Thomas Jefferson). Quivira also appears on this map. Quivira was one of the Seven Cities of Gold that drove many people to search North America for these cities. Condition: Good, small margins top and bottom, brown aging color throughout, some original hand coloring (sloppy). 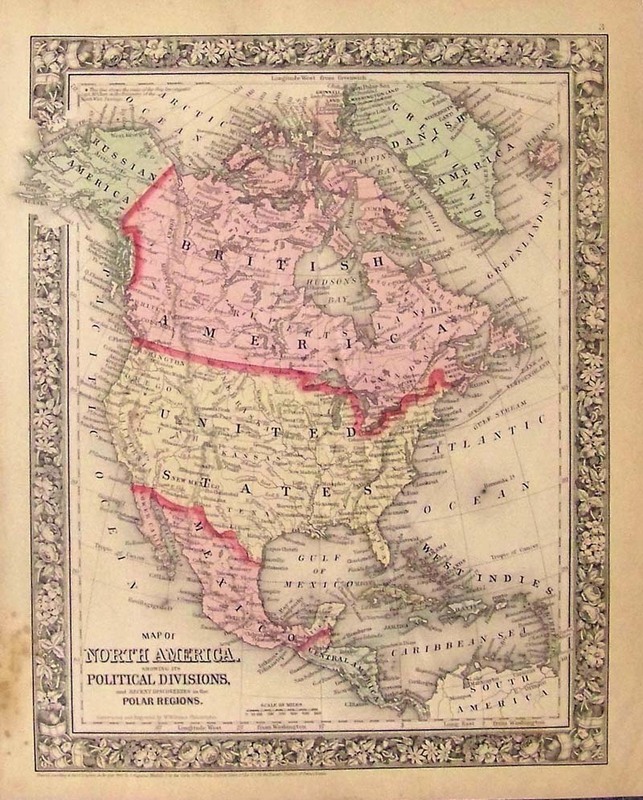 North America, Tunison, 1885 A handsome and unusual map from Tunison’s Peerless Universal Atlas created with wax engraving (cerography), more maps and atlases were able to be produced in cities beyond the major centers of New York, Philadelphia and Chicago. 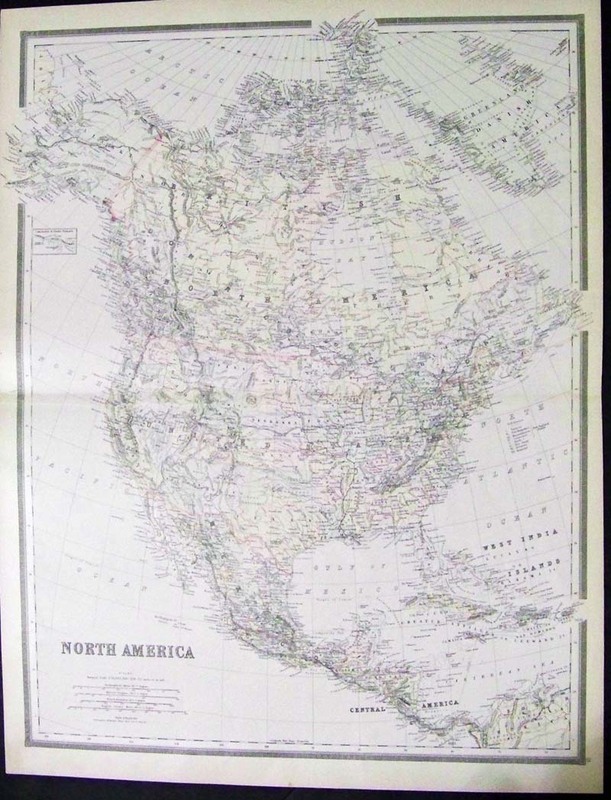 Henry C. Tunison issued a series of fine atlases beginning in 1885 and lasting into the beginning of the twentieth century. 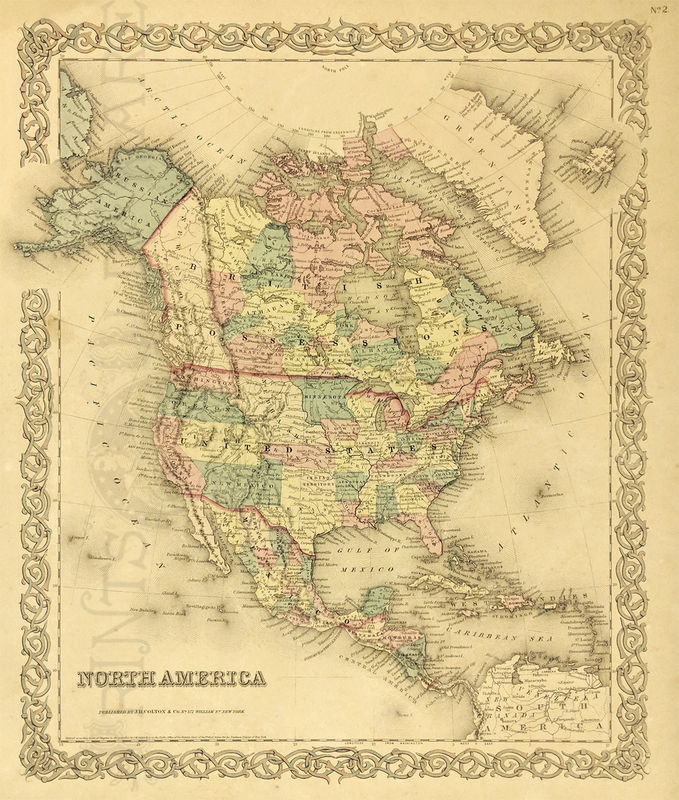 This map has brilliant color and decorative margins and is hand colored, show nearly all the states except Oklahoma and the Dakotas are one. Condition: Very good, slight tear outside image on right margin, small left margin and normal browning on margin edges, small dog ear missing from bottom right margin. 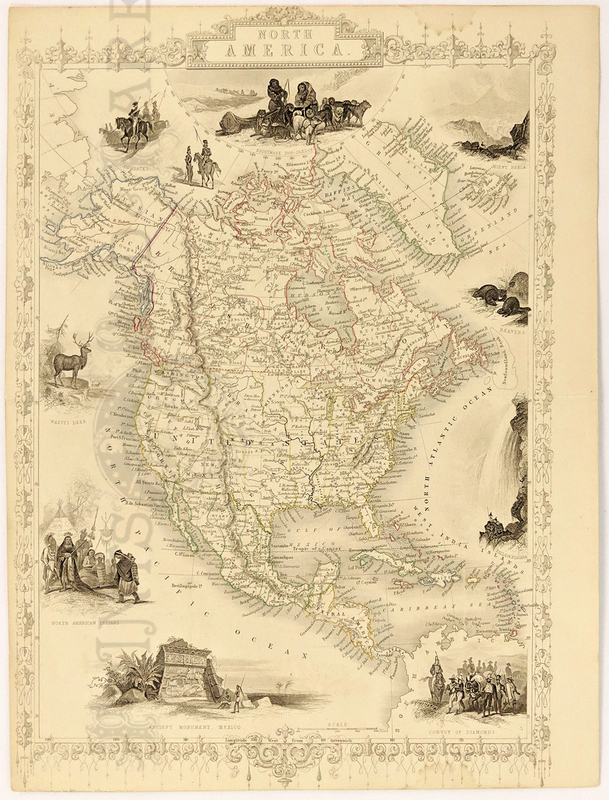 1860 Map of North America Showing its Political Division and Recent Discoveries in Polar Regions Mitchell. 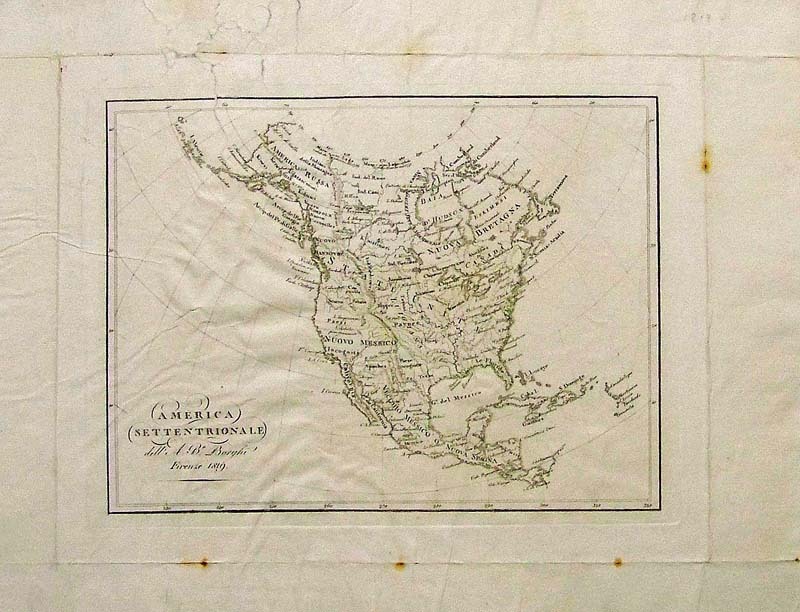 This handsome map of North America was made by S. Augustus Mitchell, in 1860, for his New General Atlas. 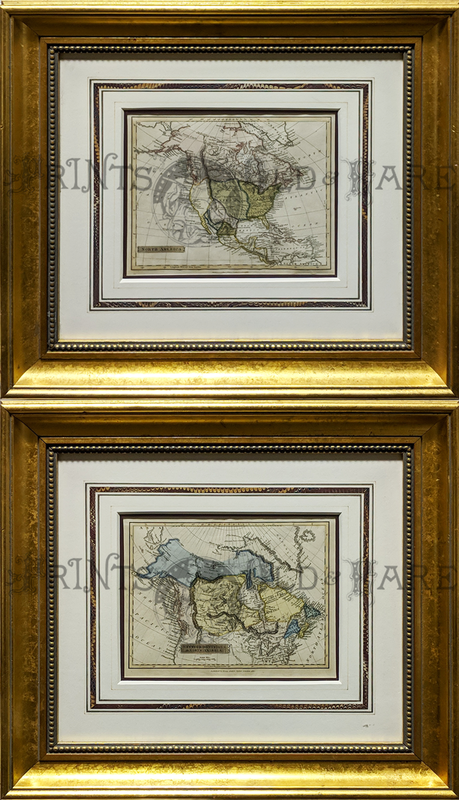 This engraved map features bright original hand coloring that differentiates regions and country sections, a decorative floral border, and fine detailing including states, cities, rivers, lakes, and other geographical features. 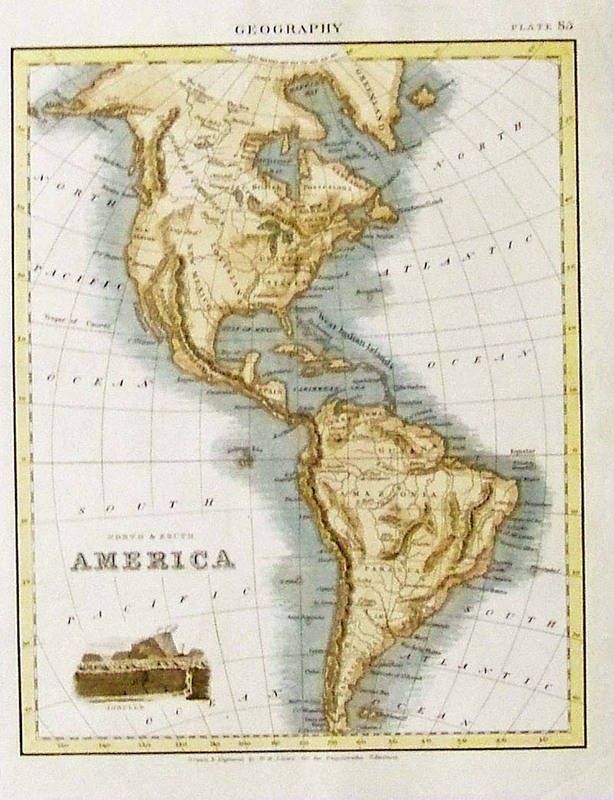 Alaska is Russian America, Arizona, Utah, Oklahoma and the Dakotas don’t exist yet and the Yucatan is depicted as a different country than Mexico. Condition: Good with normal age coloring on good margins, lower right heavy water marks and some foxing but all outside the image. size, 10 x 13.5 image. 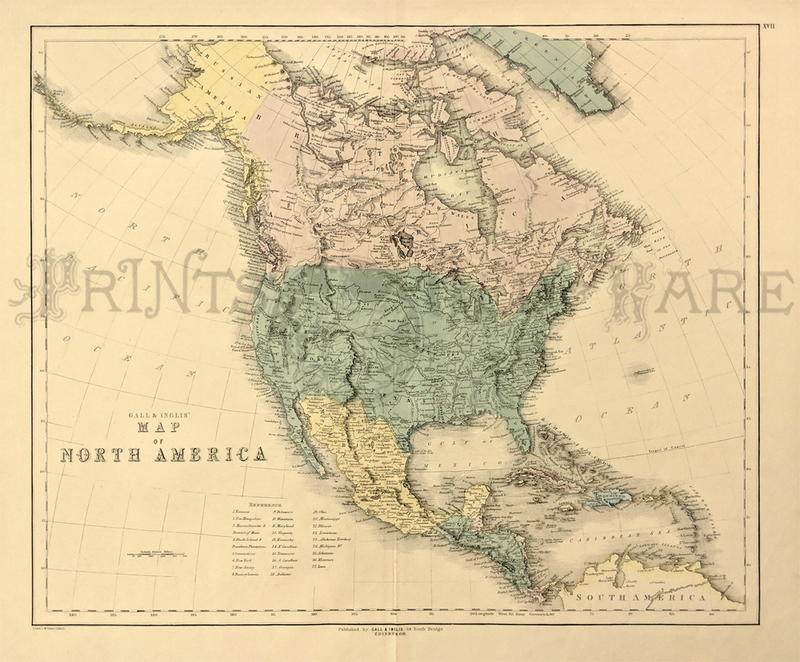 1885 Hand colored lithographed map of North America by Gray which also shows the West India Islands, Central America, Greensland Danish America Alaska, and many orher provinces and islands. 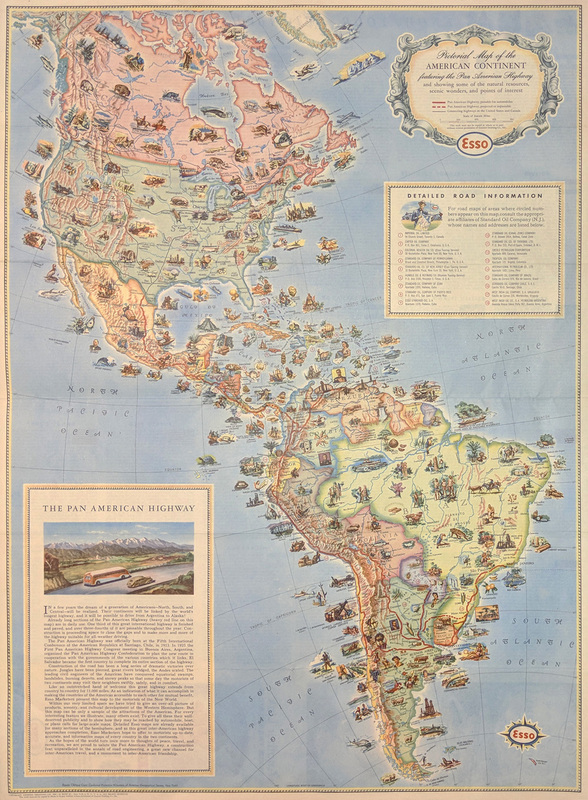 Pan American Highway Pictorial Map - Esso Corporation by American Geographical Society c1930. 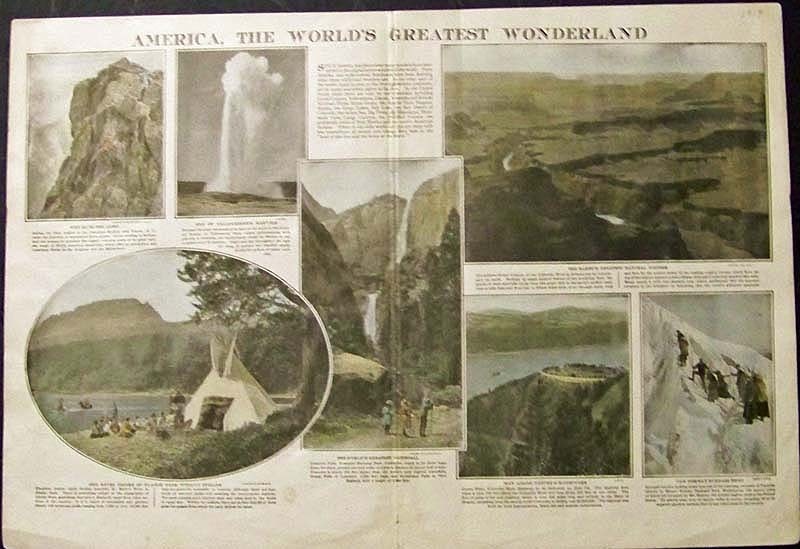 Pictorial Map of the American Continent showing scenic wonders and points of interest. Printed in color. 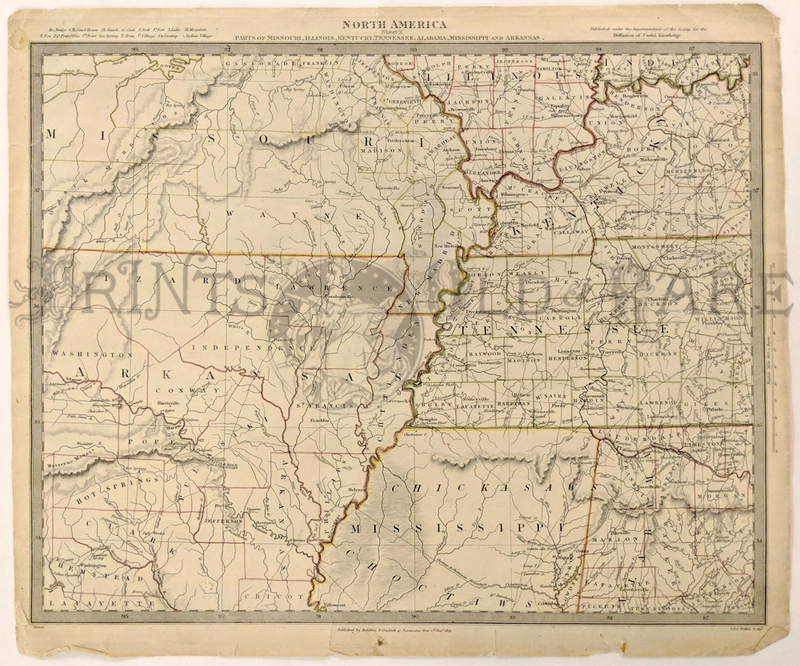 1833 North America Sheet X Map Parts of Missouri Illinois Kentucky Tennessee Alabama Mississippi and Kansas by H.S. Tanner. Published by Baldwin & Cradoc. Shows towns, rivers, mountains, Indian villages and topographical features. Little Rock, Hot Springs and Batesville are also noted. American Indian lands of the Chickasaws and the Choctaws are identified in Mississippi. 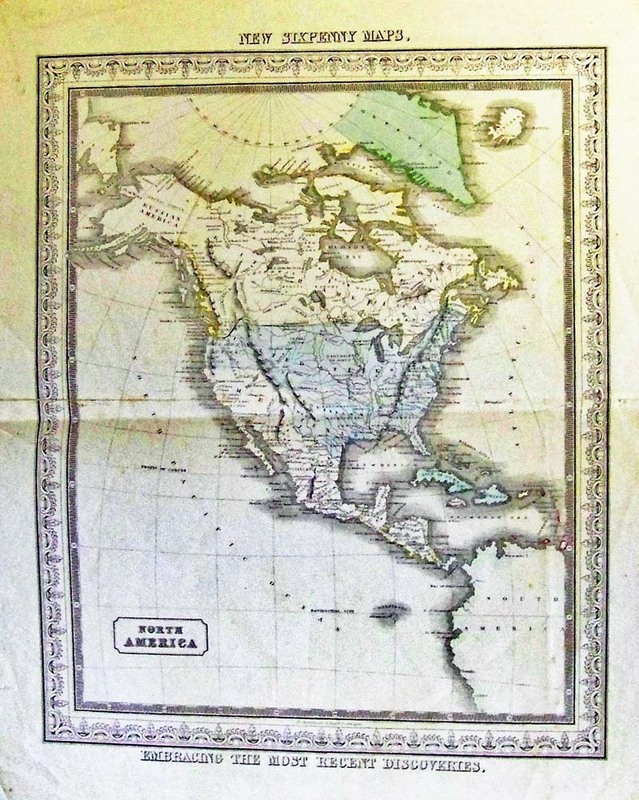 1820 Geographical, Statistical and Historical Map of America Carey - Nicely illustrated with original pastel colors, two separate maps of North and South America printed on one sheet. Original hand color differentiates nations and claims. 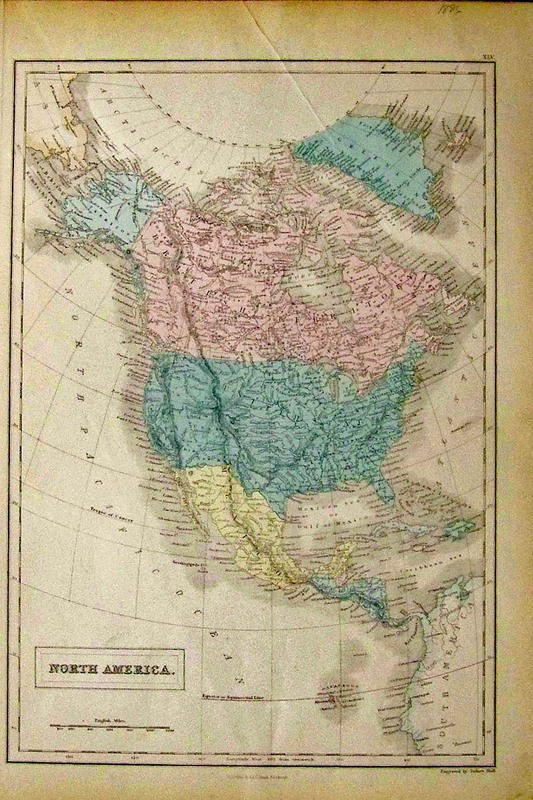 As noted on the map, this is second Philadelphia edition from 1817 London edition. 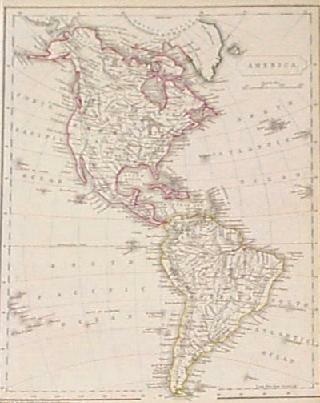 The North American map shows the routes of Columbus and Cortes. Early Canadian border with United States. Several Indian tribal regions including "Long Hair Indians". Alaska as "Russian Settlements". 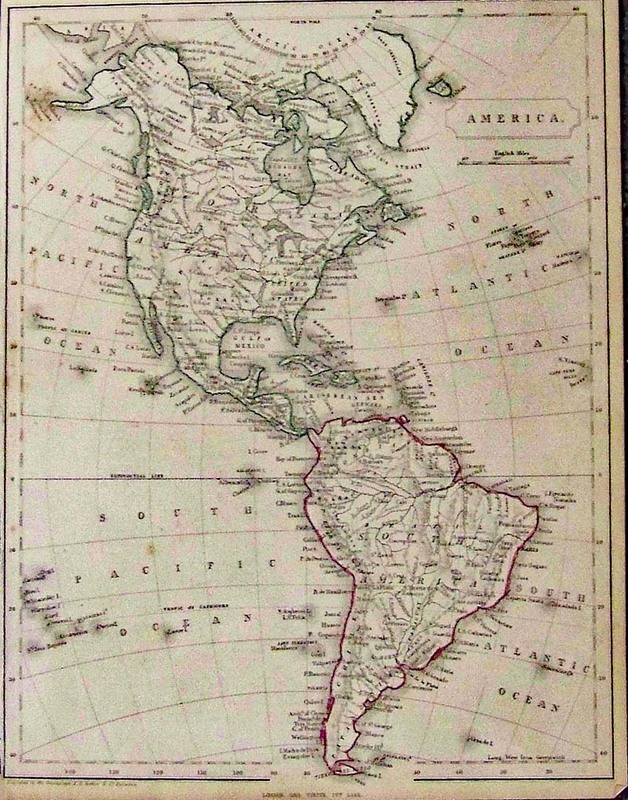 South America with Pizarro's track. The map is framed on three sides with extensive text in English full of interesting statistics and history. Published in Philadelphia. Published by M. Carey and Son 1820, Philadelphia printed from the 1817 edition. Condition: Very good, some foxing and water stains on lower right text and margin, small margin at top. size 21 x 16.5, map images 15 x 8.5. 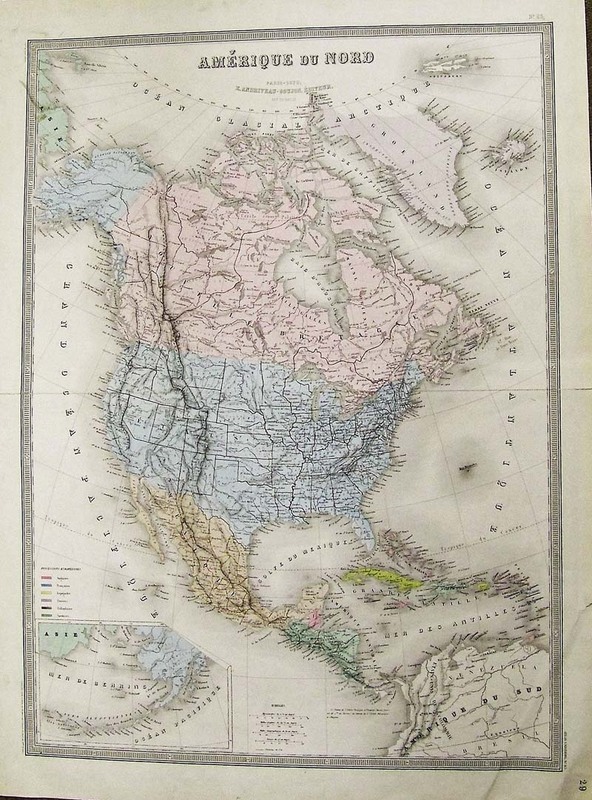 North America, Colton 1855 - A steel engraved and original colored map of North America, from Colton's General Atlas. A wonderful “time capsule map” showing Canada as British Possessions, Oklahoma as Indian Territory, one Dakota, Alaska Territory and a good section of the Artic including Greenland. Published by J.H. Colton and Company at No. 172 William St. New York in 1857. 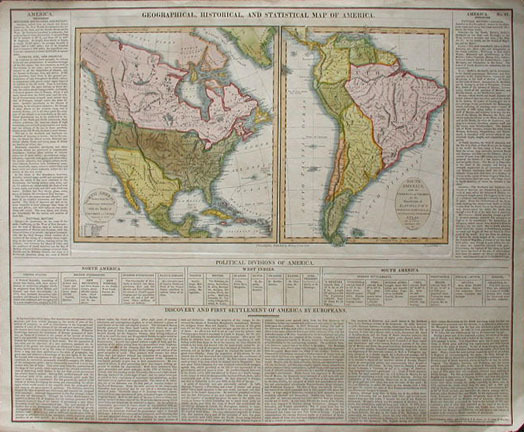 This is from the first edition of Colton's General Atlas, the first being a two volume issue in 1855. 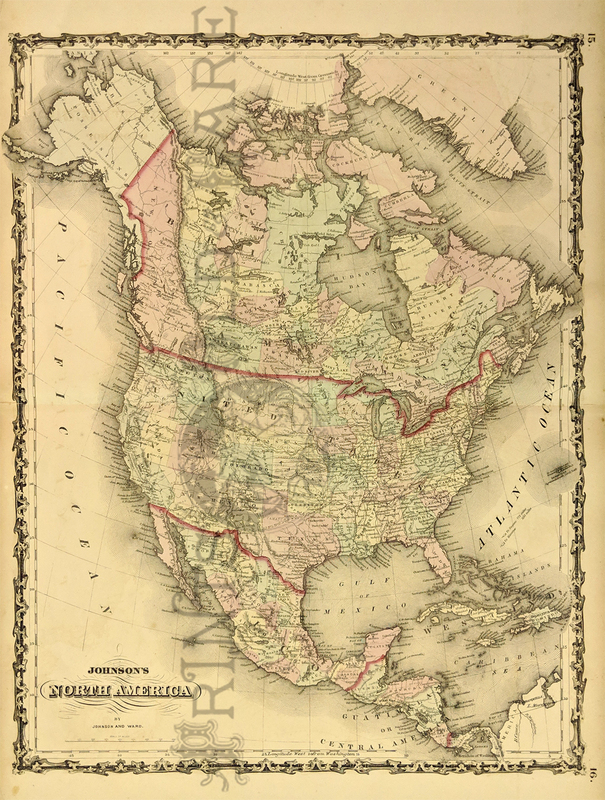 This historic map of North America shows many details of towns, roads and waterways in a period just before the US Civil War. Condition: Very good, wide margins, light browning on the edges. 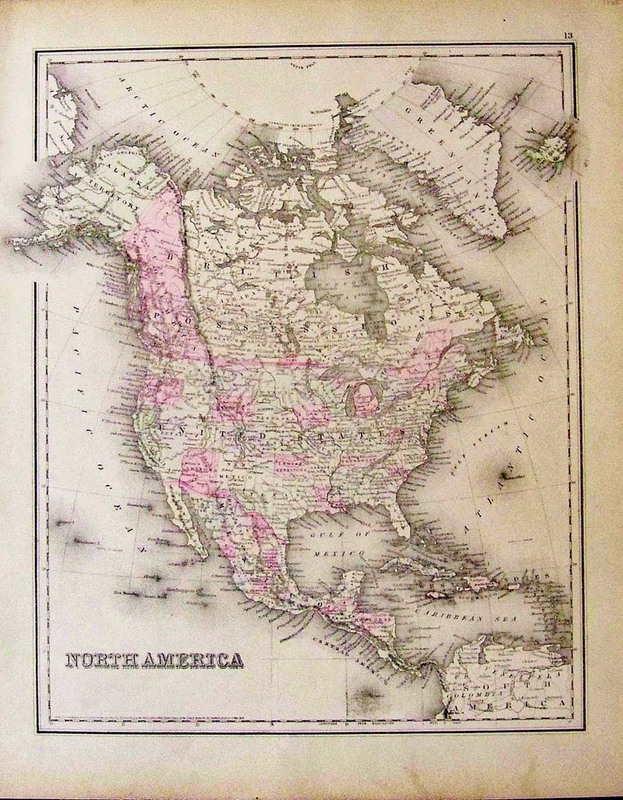 North America, Letts and Sons, 1883 - A nice and decorative lithographed map with original color published in London by Letts and Son & Co. Limited. 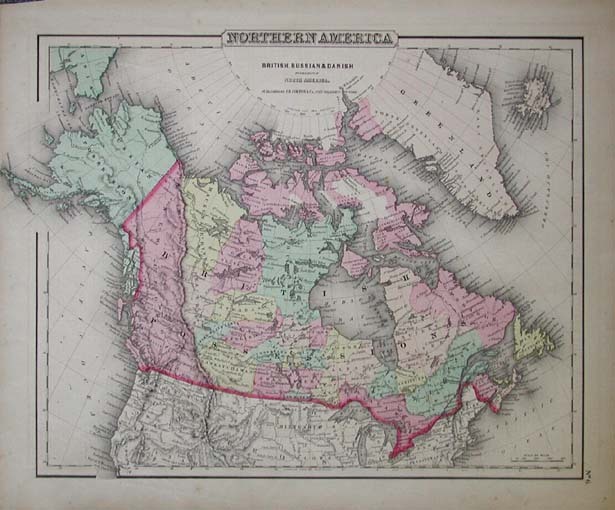 Dominion of Canada stretches across the country, the Dakotas are one, Oklahoma doesn’t exist yet and the map has nice pastel coloring as with most Letts maps. Thomas Letts took over the family owned publishing company in 1835 and was joined by his son Charles in 1870 when the Limited company was set up. Condition: Very good printed on fine paper, fold in middle, has slight marginal soiling. 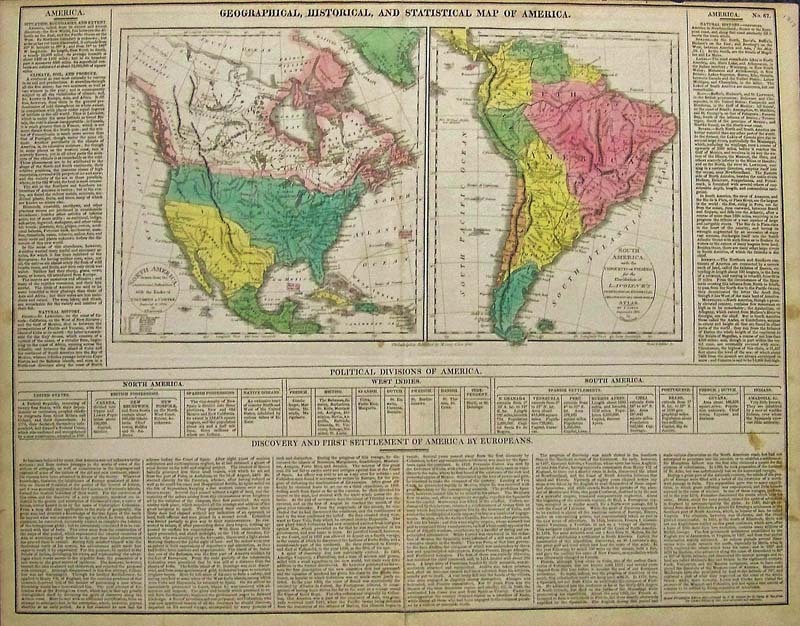 North and South America, Becker and Patentees 1850 - An unusual small, omnigraph engraved map of North and South America, by Francis Paul Becker and Company, Patentees circa 1850 for a small atlas. Contemporary outline color, of each continent, with details of Indians and some countries, no California. Condition: Good, this map was published with narrow borders particularly on the left side, some light foxing on image and browning on margin edges. 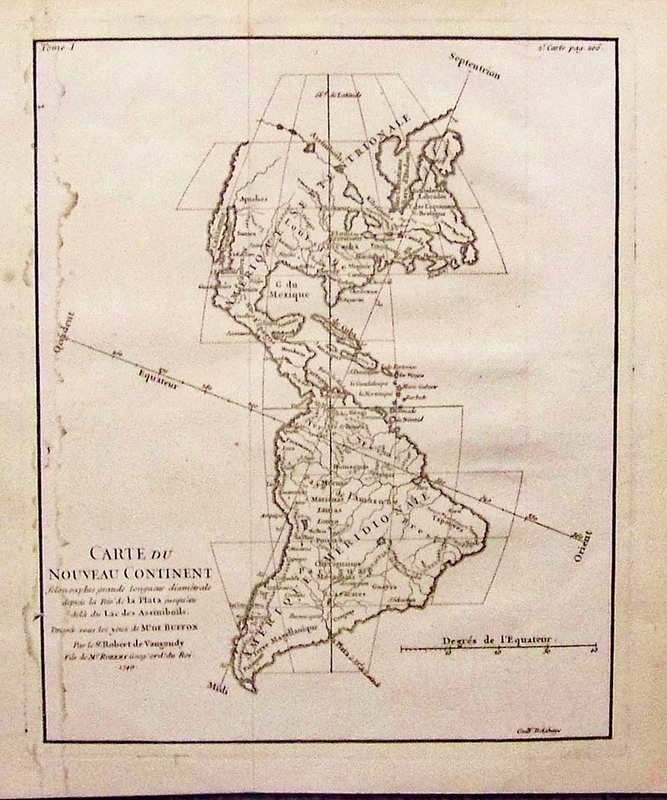 Carte Du Nouveau Continent, de Vaugondy, 1749 - A copper engraved black and white map with the North-South and East-West axis at oblique angles to the continents. In North America, the Pacific Northwest coastline is not depicted and a series of rivers and lakes make up a Northwest Passage. At upper right, inside the neat line is "2. e Carte page 206." This map is given a full-page illustration in Pedley's book on page 94 and is discussed in her chapter "Maps that Illustrate and Teach." Condition: Good, water stains on left margin into image, two folds. 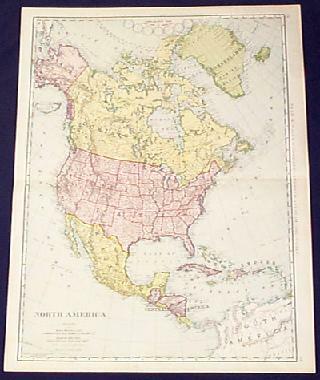 1850 Rare Thomas, Cowperthwait & Co. color Map of North America which shows Alaska still being part of Russian Territory. Entered According to Act of Congress in the Clerk's Office of the District court of the Eastern District of Pennsylvania. 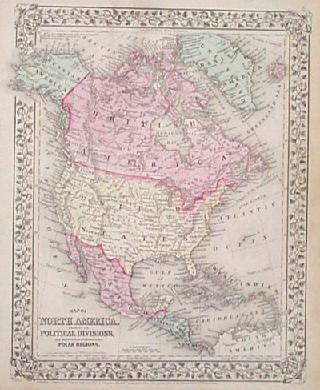 1819 French mapof North America which shows the Indian Tribes and is titled, "America Settentrionale." 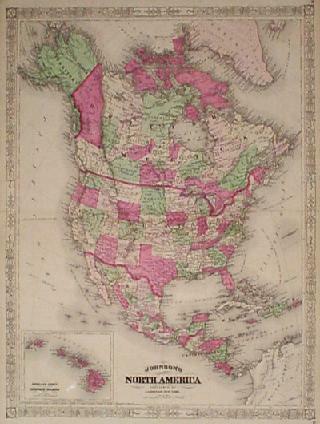 1865 Hand colored engraved map of North America, Entered According to Act of Congress by J.H. Colton & Co., in the Clerk's Office in the District Court in the United States for the Southern District of New York. Top right of map shows part of Greenland and top left shows Alaska Territory. 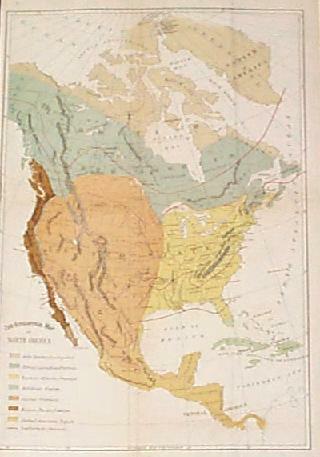 Backside of map shows the Population of the United States, From 1790 to 1880. 1873 Hand colored engraved Stieler's German Hand Atlas No. 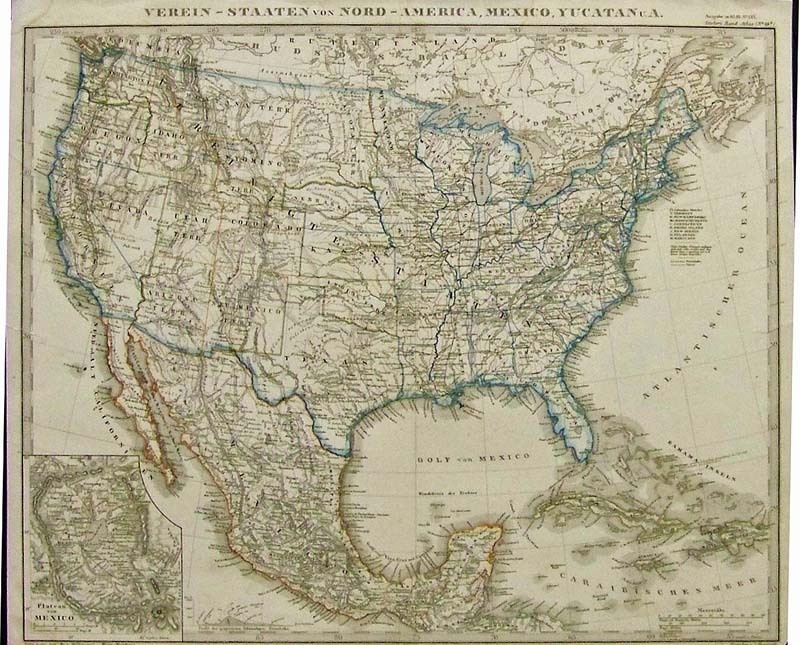 79 titled, "Nord-America, Entworfen u. gezeichnet von f. von Stulpnagel." 1746 Hand colored copper engraved Map showing Amerique Septentrionale (French Map of North America) by Jean Baptiste Bourguignon d'Anville. Paris. Four professionally joined sheets. 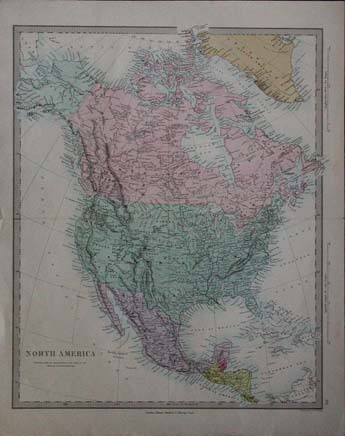 1861 Johnson's Map of North America. Showing a number of important routes, the Pony Express and U.S. Mail Route. Also shows numerous American Indian tribes. Hand colored, lithograph. 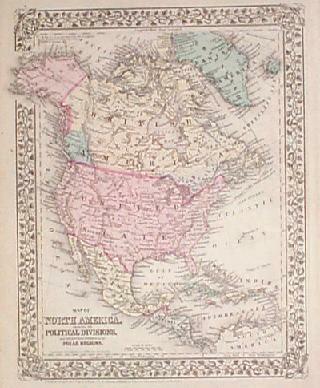 Gall & Inglis' Map of North America. c.1880's. 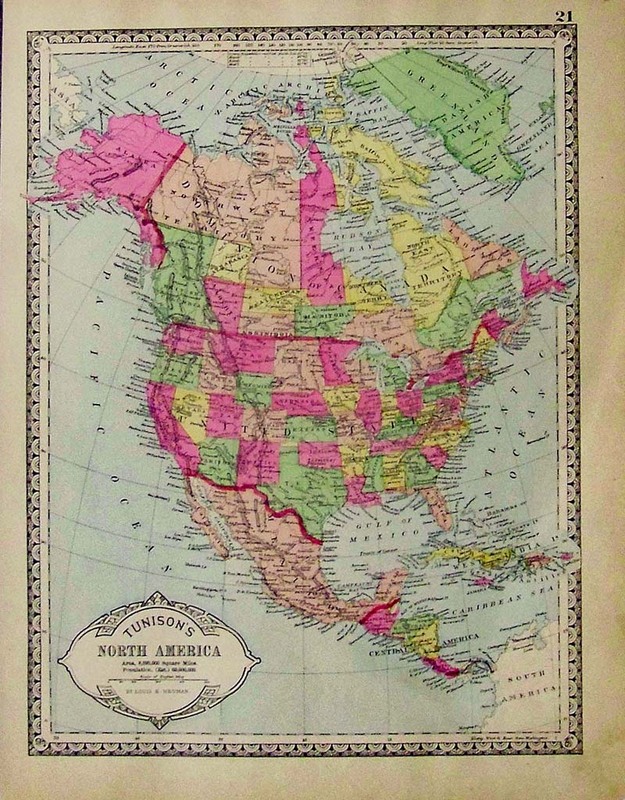 Texas, Upper California and Oregon Territory are shown in the West, along with a massive Missouri Territory. Canadian Transmississippi West is also shown along with the missions in California. In Oregon, the British Claims extend to the Columbia River, encroaching on the American claims to Puget Sound. Alaska is Russian Territory. Hand colored, lithograph. 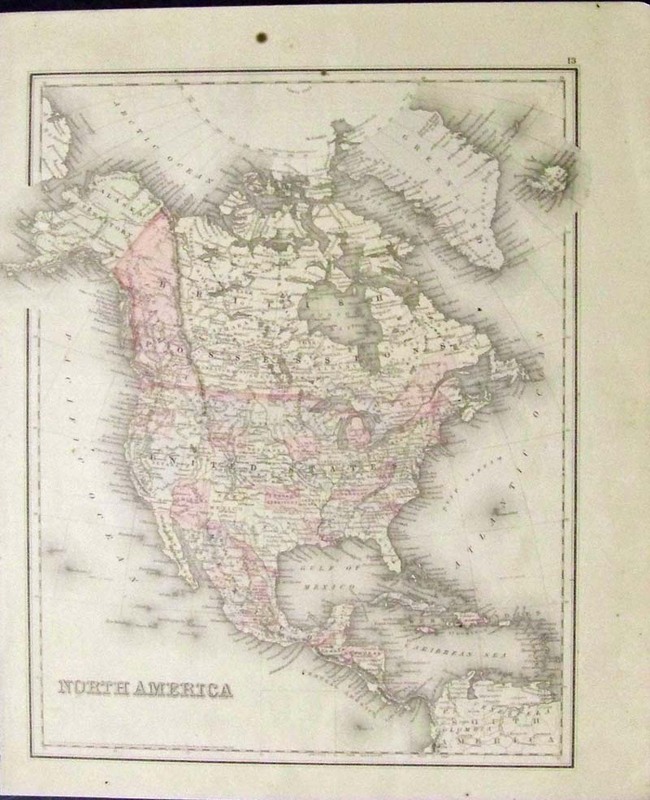 1856 Charles Desilver's Map of North America. 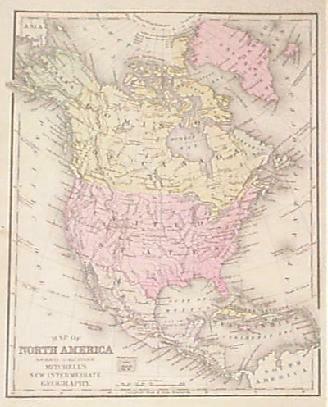 Detailed map showing North America, Central America, the West Indies, Mexico, the United States, Canada, and Russian Alaska. Nebraska Territory encompasses most of the Northern part of the United States. Major cities, river systems, and other features are depicted in significant detail, along with International borders. 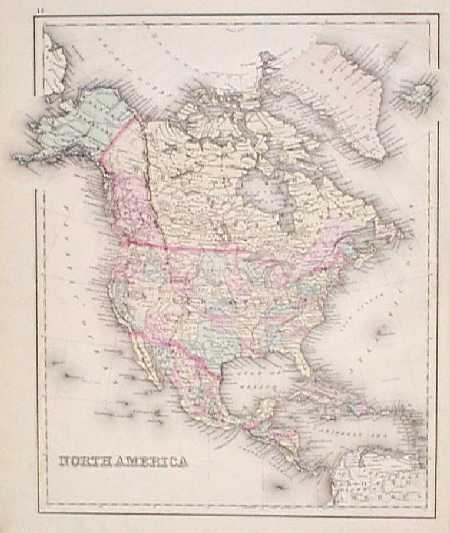 Published in the final edition of "Mitchell's New Universal Atlas," S. Augustus Mitchell had sold the atlas publishing rights to Thomas Cowperthwait who then sold them to Charles DeSilver in the mid 1850s. 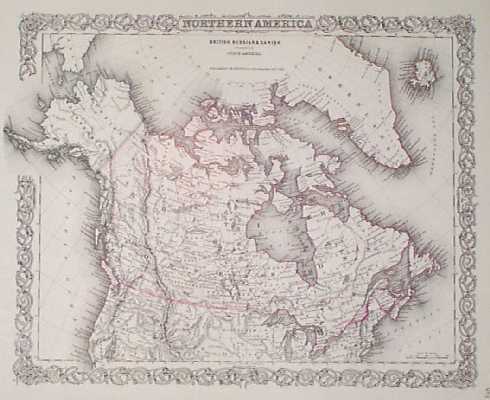 1851 North America Map by Tallis. Decorative border featuring 10 vignettes of local scenes. Details of the map include rivers, topography, coastline, towns and political divisions. 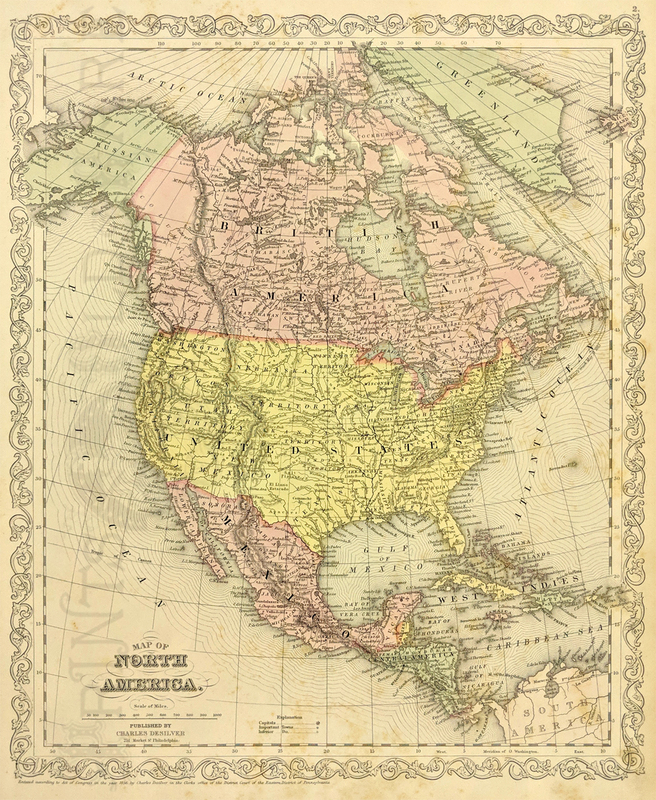 *Map does not show the American acquisition of the state of upper California from Mexico as a result of the Mexican-American War. 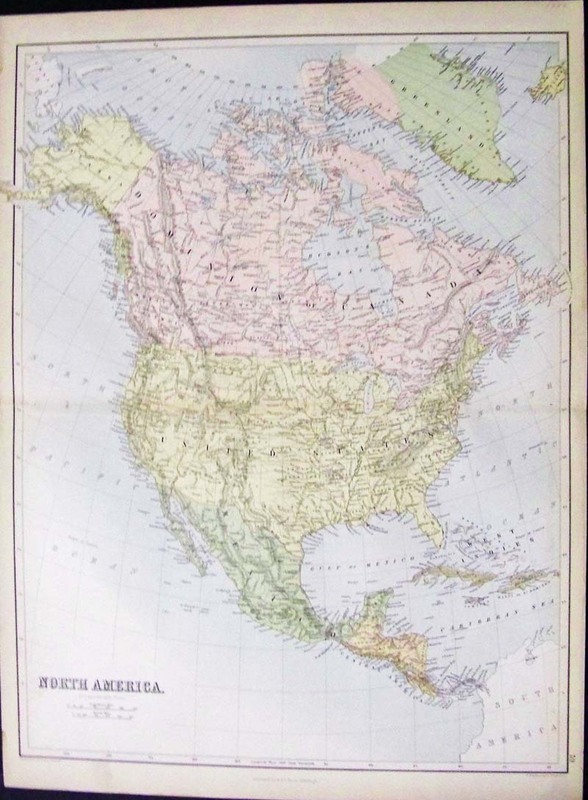 1920 Large North America Map. 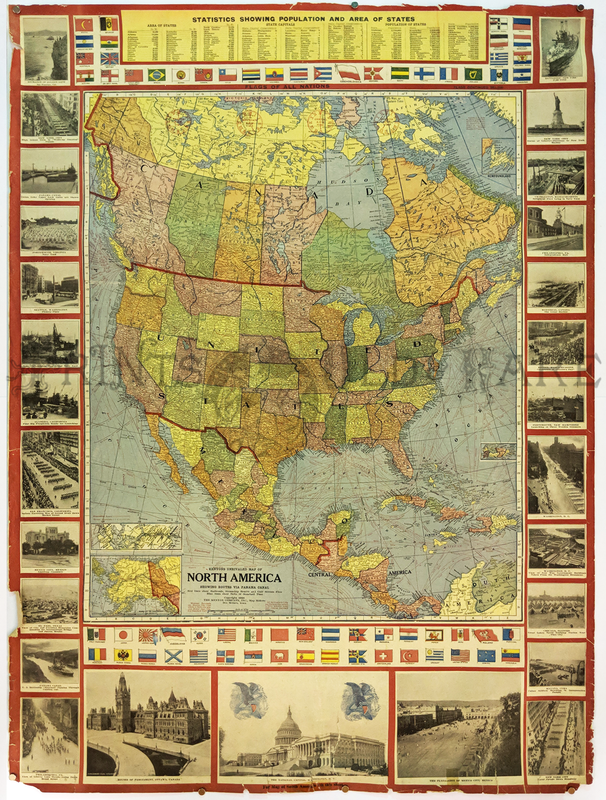 Colorful patriotic WWI era map bordered with timely photos. Shows flags of all nations and state statistics of area and population. 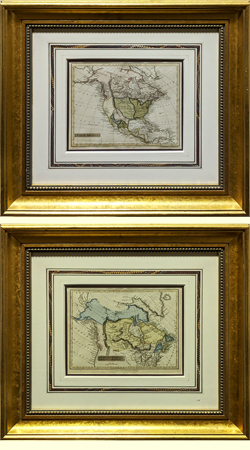 EXQUISITE PAIR - North America and British Dominions in North America by Fisher, 1823. 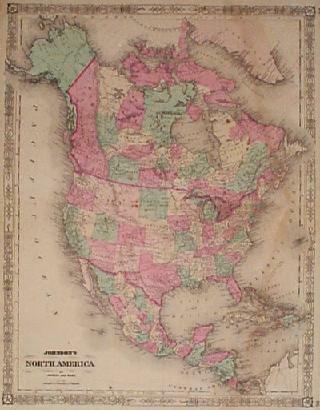 US includes Louisiana Purchase but the rest of the west is still part of Mexico. Gorgeous gold leaf frames with beading and handmade French mats. Museum quality. 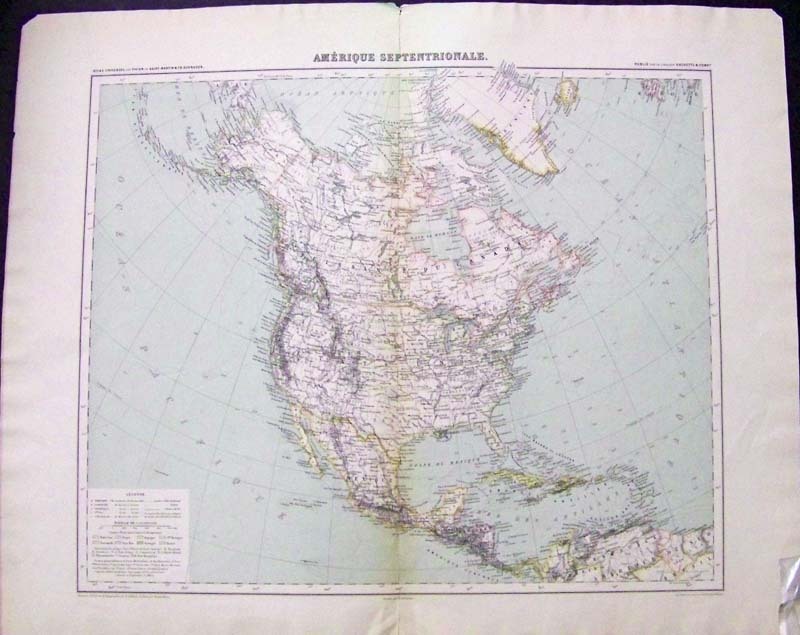 1900 Amerique Septentroinale Atlas Universel par Vivien de Saint-Martin & Fr. Schrader. Map is outlined in color and shows European possession by color. Legende is on bottom left of map Publie par la Librairie Hachette & Comp. 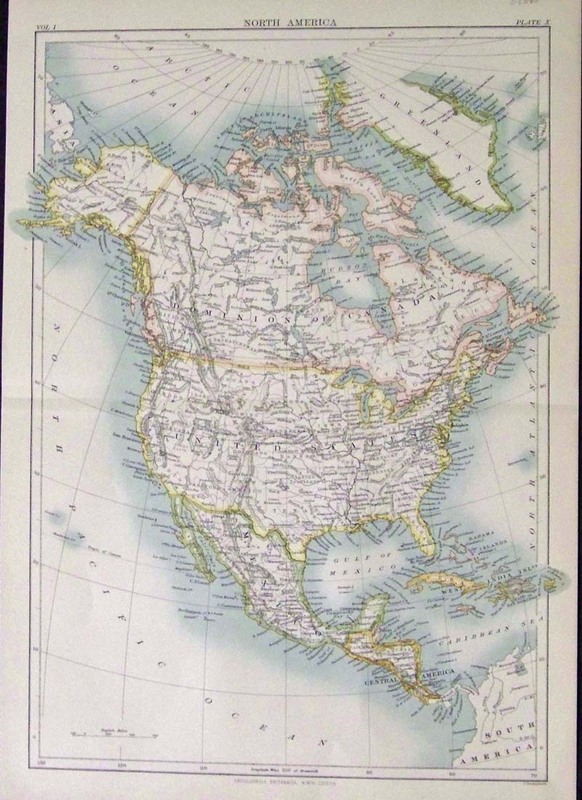 1884 Engraved map of North America by Keith Johnston, F.R.S.E. outlined in color. Engraved, Printed & Published by W. & A.K. 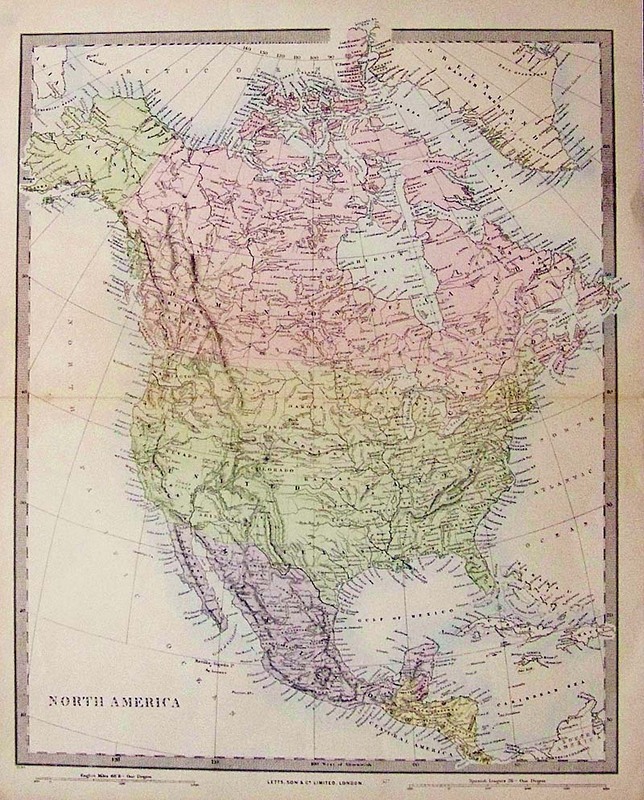 1882 Hand colored engraved map of North America by J. Bartholomew, F.R.G.S., and published by A & C. Black, Edinburgh. 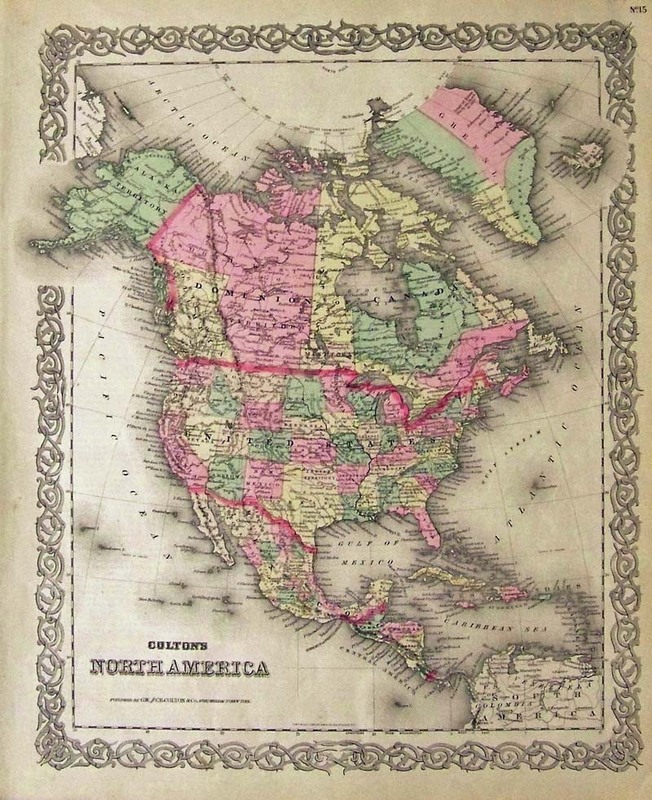 Amerique Du Nord 1870 Gujon - A large and very attractive engraved and printed in color map, published by Chez E. Andrivea-Goujon, Paris, 1870 in the Universal Atlas. Many interesting details. The inset is of the Aleutian Islands. Map is very detailed and beautifully colored. 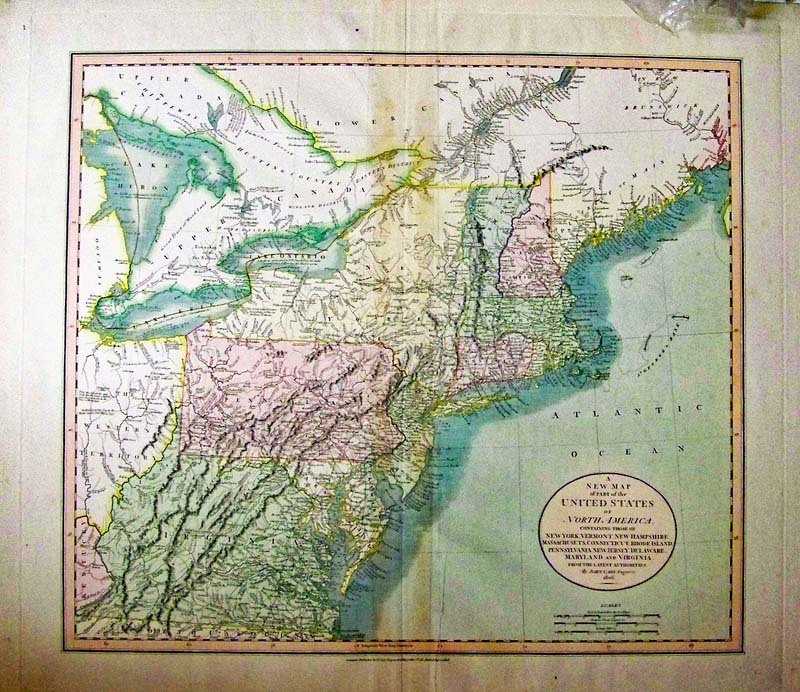 Condition: The horizontal center crease is the result of the map's binding within an atlas. Slight tearing on bottom right margin, smudge on top left where Russia meets Alaska and wide margins. Size, 17.5 x 24 in. image. Map of North America Mountain System as a Unit, the Great Calcareous Plain and Details and the Maritime Selvage, Gilpin 1873 - A very rare attractive, engraved and large geological map of North America from the late 19th century, beautiful original color, the map shows all of North America, Mexico, Central America, and the Arctic Ocean. Most of the United States are shown except for Oklahoma and Dakota are one state. 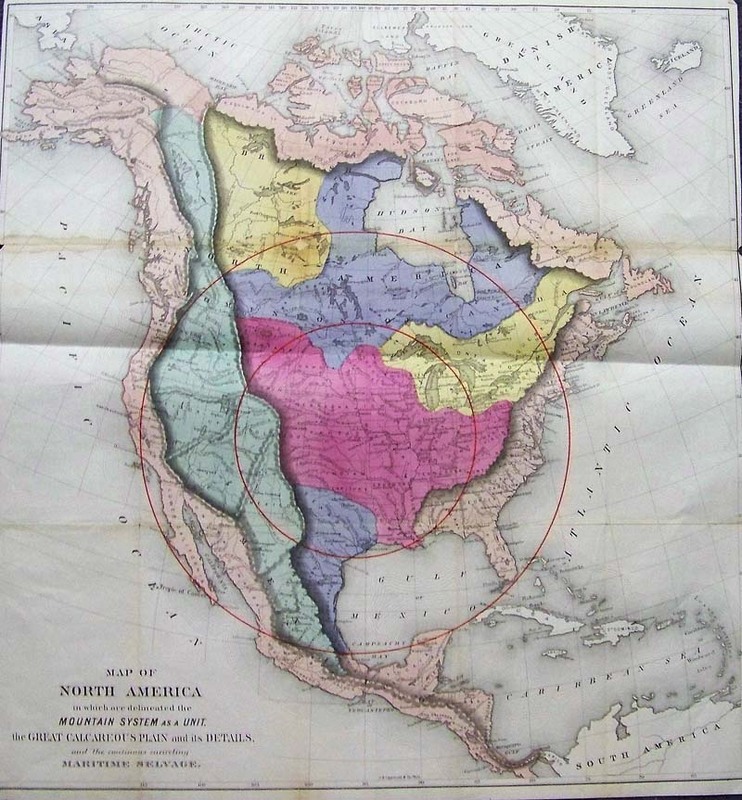 Mountain ranges are nicely shaded, along with geographical regions, and two large red circles are shown centered on the middle of the U. S. Special Note: William Gilpin (1813-1894) was a 19th century US explorer, politician, land speculator, and futurist writer about the American West. He accompanied John Fremont on his second expedition through the West, and was instrumental in the formation of the government of Oregon Territory. As a politician he was an inveterate believer in Manifest Destiny and was a visionary booster of new settlement in the West, helping lay the groundwork in his writings for a modern theory of the succession of civilizations. Gilpin was a strong believer that the American West would not only be settled but also eventually hold an enormous population. He was a particularly strong advocate of the now-debunked climatological theory of “Rain follows the plow.” Which held that settlement in the arid lands of the West would actually increase rainfall in the region, making it as fertile and green as the Eastern US. 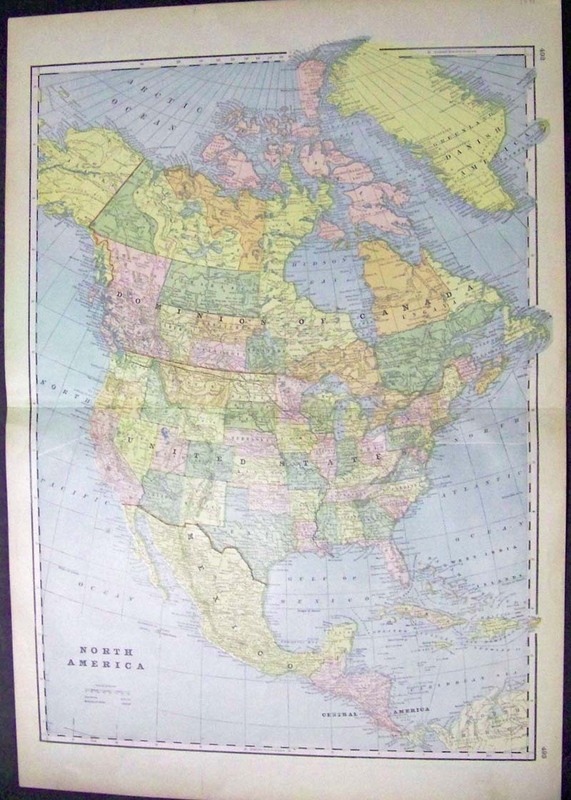 Condition: Good, small margin and two folds, discoloring on top left fold extends into image across Canada, with small tear out. 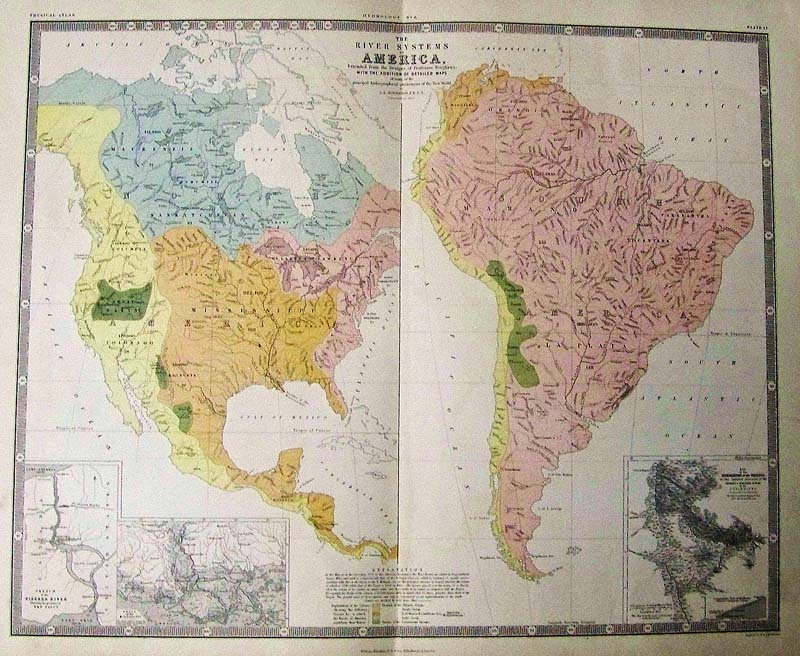 The River Systems of America, Johnston 1855 - A large double folio and rare original steel engraving with original hand color map of the river basins of North and South America, with Niagara, Mississippi and Orinoco insets. What is most unusual about this map is that is shows the Great Basin, this is rare. The length of each river is cited, and the maps feature a beautiful pastel coloring. 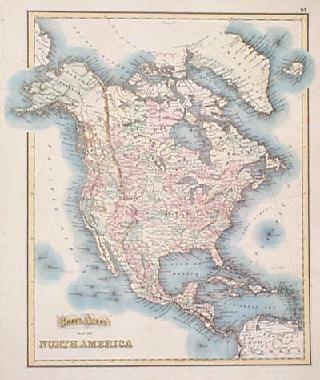 The River Systems of America, Extended from the Designs of Professor Berghaus, with the addition of detailed maps of some of the principal hydrographical phenomena of the New World by A.K. Johnston F.R.G.S. Corrected to 1855. William Blackwood & Sons: Edinburgh & London. . Condition: Very good, fold in middle, some browning on edges, small tear on bottom fold. 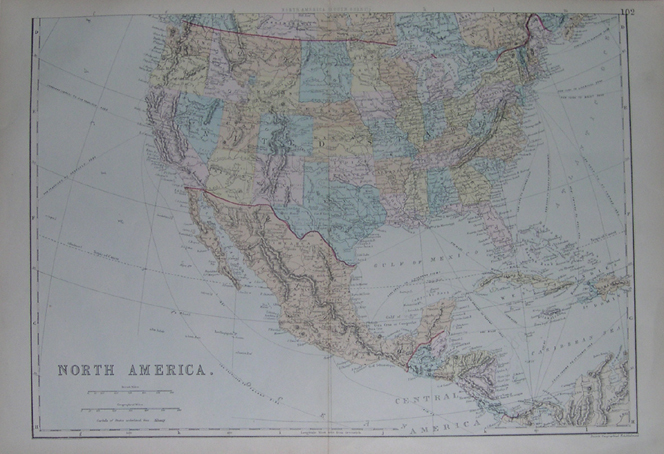 1897 "The Century Atlas, North America, copyright by The Century Co., New York. 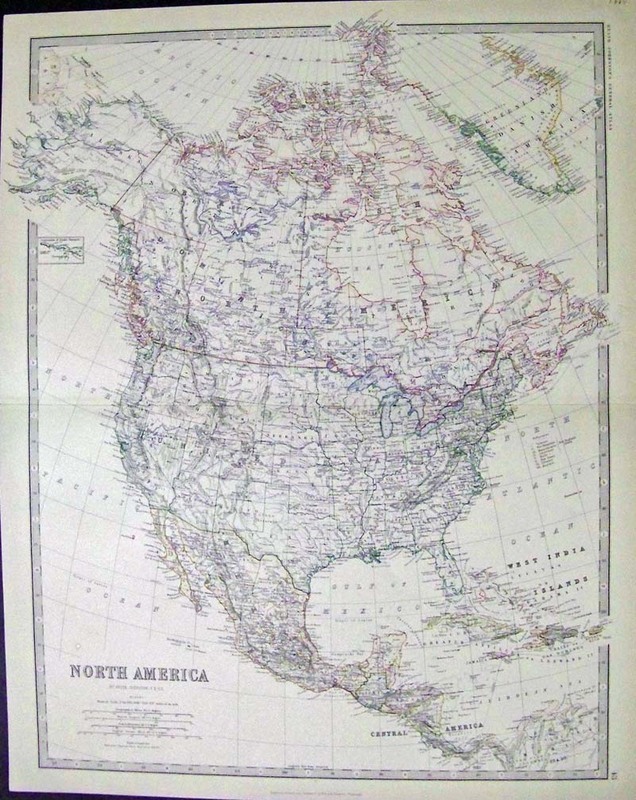 Map was printed in color and shows adjacent explorer's routes throughout North America. 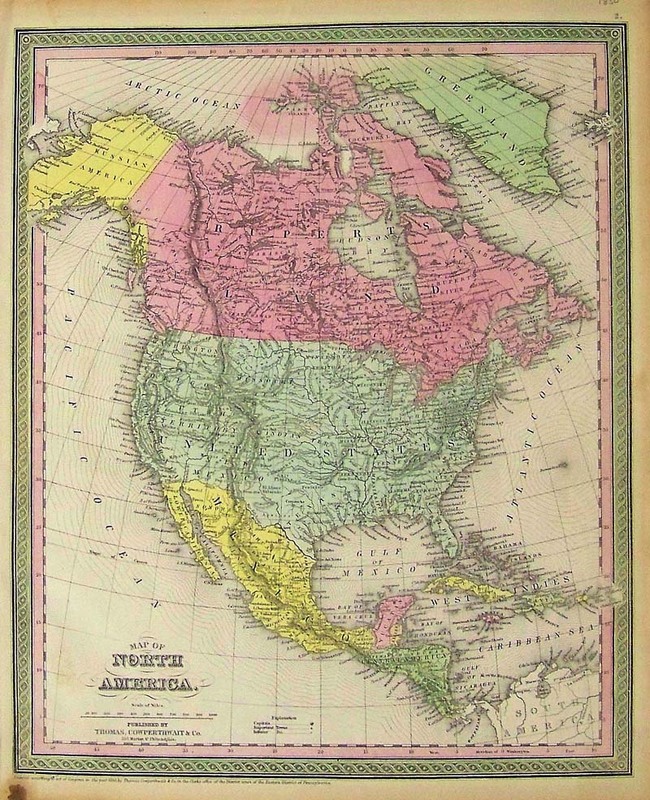 C.1880 map showing North America which was featured in the Encyclopaedia Britannica, Ninth Edition. Outlined in color, Plate X. 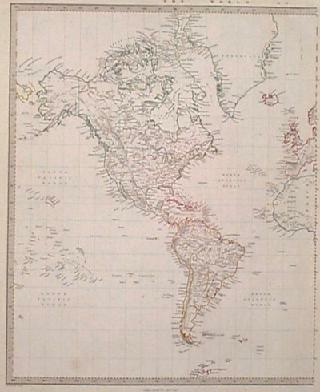 1820 Color engraved map showing North and South America from Geography, Plate 85. Note the ancient territory. 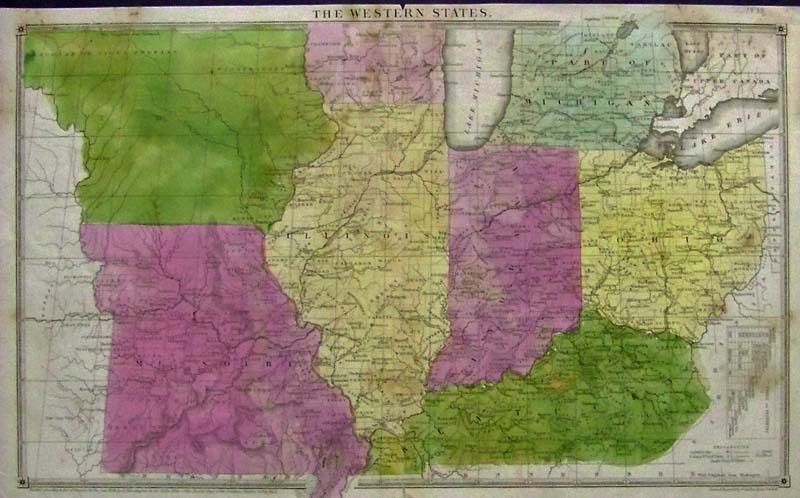 1868 Rare original hand color map showing The Western States showing Missouri, Illinois, Iowa, Kentucky, part of Michigan, Indiana, Ohio, Lake Michigan and Lake Erie. Entered According to Act of Congress by E.J. Huntington in the Clerk's Office of the District Court of the Southern District of New York. 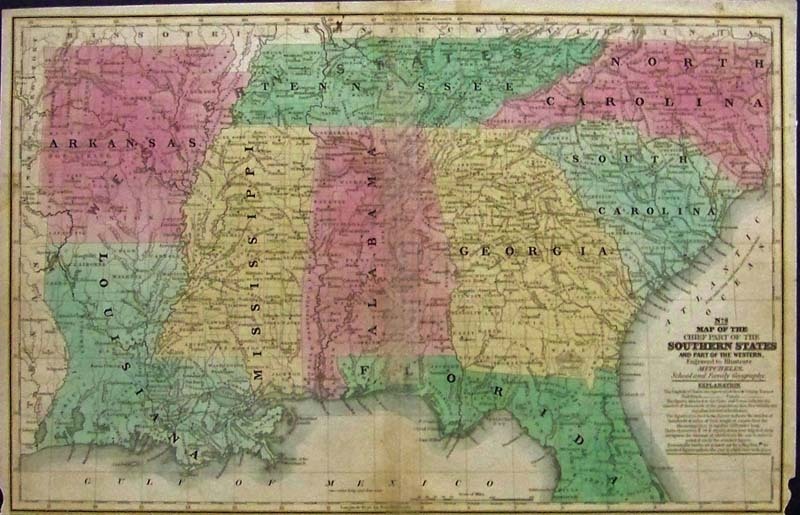 1838 Very early pre-CivilWar Map of the Chief Part of the Southern States and Part of the Western, engraved to illustrate Mitchell's School and Family Geography. States shown are Arkansas, Louisiana, Mississippi, Tennessee, Alabama, Georgia, North Carolina, South Carolina, Florida, and the Gulf of Mexico.